Our palette covers the gamut when it comes to tattoos and discolorations. Intensely pigmented cremes provide flawless, long-wearing and "invisible" coverage. 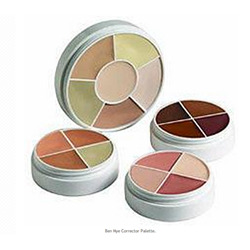 Be totally prepared to cover blemishes and skin discoloration with our highly pigmented shades. Exceptional versatility for the busy artist. 6 Color Palette (NK-11) Includes Shades: NB-1 Blue Neutralizer No.1, NB-3 Blue Neutralizer No.3, NT-1 Tattoo Cover No.1, NR-1 Red Neutralizer No.1, MY-3 Mellow Yellow Classic and GC-1 Special Green Concealer No.1. 4 Color Fair/Medium Palette (NK-1) Includes Shades: NB-1 Blue Neutralizer No.1, NT-2 Tattoo Cover No.2, NB-2 Blue Neutralizer No.2, and NR-1 Red Neutralizer No.1. 4 Color Olive/Brown Palette (CSK-31) Includes Shades: SC-16 Deep Red, SC-8 Golden Yellow, SC-6 Sienna Orange, and SC-4 Adobe Brown. Neutralizers may be applied beneath or over foundation. Apply with a flat or dome brush; blend, then powder lightly before applying foundation. For intense discoloration, carefully apply additional layers of neutralizer.